Mount Kenya potto Perodicticus ibeanus stockleyi Butynski & De Jong, 2007 is only known from one specimen, collected in 1938 at 1,830 meters above sea level on Mount Kenya, central Kenya. This subspecies has not been observed alive for 79 years and is, thus, considered to be both a ‘Critically Endangered’ subspecies (Butynski & De Jong, 2017a) and ‘lost’ subspecies. Mount Kenya potto is a small bodied (about 1.5 kg), nocturnal, arboreal, cryptic, and quiet (no loud call) primate, all of which make it difficult to detect. This subspecies is thought to be endemic to the moist forests of the Central Kenya Highlands. Indeed, its geographic range might be restricted to a small area of forest on Mount Kenya. 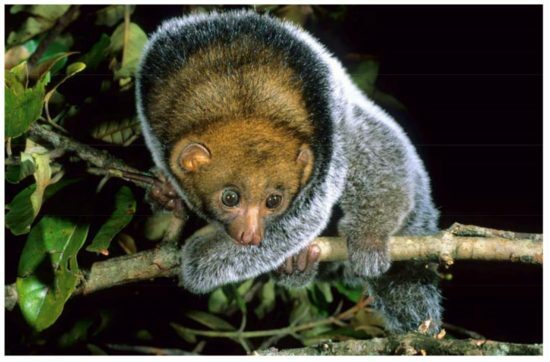 Based on what is known of the distribution of eastern potto Perodicticus ibeanus, Mount Kenya potto is expected to live in moist forest between 1,050 and 2,300 metres above sea level. Geographic range of the three species of Perodicticus, type locality for the Mount Kenya potto Perodicticus ibeanus stockleyi, and location of Muguga. Based on Butynski and De Jong (2007), Oates (2011), De Jong et al. (2017a,b), Svensson and Pimley (2017), and Svensson et al. (2017). 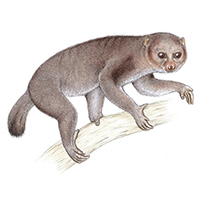 Butynski and De Jong (2007) speculate that Mount Kenya potto occurs at low density and/or is highly localized in its distribution–or that it is extinct. Nocturnal primate surveys on Mount Kenya and in other moist forests in the Central Kenya Highlands since 2001 have not revealed evidence of this subspecies. In 2017, 10 years after P. i. stockleyi was described, it appears on the IUCN Red List as ‘Critically Endangered’ (Butynski & De Jong, 2017a). 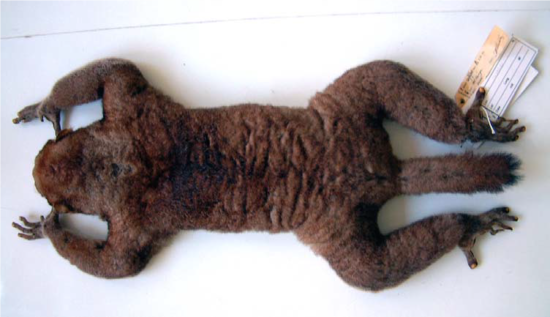 The specimen in this photograph is the holotype for the Mount Kenya potto Perodicticus ibeanus stockleyi. This adult female was collected on Mount Kenya by Lt.-Col. Charles Hugh Stockley on 20 June 1938. Photograph by Yvonne de Jong and Tom Butynski. Adult Mount Kenya potto Perodicticus ibeanus stockleyi. Drawing by Stephen Nash. Reproduced from Butynski and De Jong (2007). Hope remains that the Mount Kenya potto will be ‘rediscovered’ (Butynski & De Jong, 2017b). Although the two large blocks of highland moist forest that remain east of the Eastern Rift Valley (i.e., Mount Kenya and Aberdare Range) are under great threat due to the activities of a dense and rapid growing human population, much forest remains to be surveyed. Most of this forest is within national parks or forest reserves. In addition, eastern potto can persist in secondary and colonising forest, and on forest edge close to agriculture and human habituation. Future surveys to locate Mount Kenya potto should focus on the wettest and lowest forest on and near Mount Kenya and the Aberdare Range. 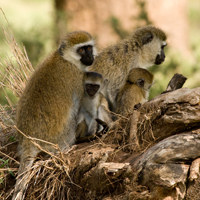 The distribution and abundance of all of Kenya’s primate species and subspecies is in decline. The human population of Kenya is doubling every 20-25 years and, as a result, natural habitats are being rapidly degraded, fragmented, and lost. Similarly, the Nation’s biodiversity is under ever increasing pressure and many species have been lost from large areas. As concerns the Mount Kenya potto, the conservation priorities are to determine whether this subspecies survives and, if so, where and in what numbers. At present, however, Mount Kenya potto will continue to be considered one of the world’s ‘lost’ primates. Adult eastern potto Perodicticus ibeanus ibeanus in Kakamega Forest, southwestern Kenya. Photograph by Harald Schuetz. Reproduced from Butynski and De Jong (2007). Butynski, T.M & De Jong, Y.A. (2007). Distribution of the potto Perodicticus potto (Primates: Lorisidae) in eastern Africa, with a description of a new subspecies from Mount Kenya. Journal of East African Natural History 96: 113-147. Butynski, T.M & De Jong, Y.A. (2017a). Perodicticus ibeanus stockleyi. IUCN Red List of Threatened Species 2017. Oates, J. F. (2011). Primates of West Africa: A Field Guide and Natural History. Conservation International, Arlington, VA.
Svensson, M.S. & Pimley, E. (2017). Perodicticus edwardsi. The IUCN Red List of Threatened Species 2017. Svensson, M.S., Pimley, E., Gonedelé Bi, S. & Oates, J.F. (2017). Perodicticus potto. The IUCN Red List of Threatened Species 2017.